August is National Immunization Awareness Month. This is the perfect time for you to visit with your elder parent and their doctor to discuss the immunizations that they may need to properly guard their health, and to empower them to follow through with these recommendations so that they can enjoy the longest, healthiest life possible as they age in place. One of the ways that you can do this is by helping them prepare for their immunizations. 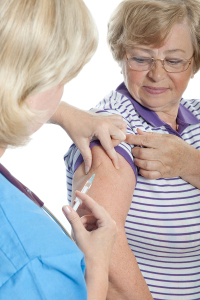 Many elder adults have not received immunizations since they were children. Some have the perception that getting vaccines is something that only young people do and that now that they are older they do not need to get them. The truth, however, is that there are several immunizations specifically recommended for seniors over the age of 64 to protect them from common infections and illnesses of older adulthood. Taking some time to prepare your parent for their immunizations can help to ease anxiety and fear that they may experience associated with getting these shots. Explain their importance. Talk to your parent about the importance of getting the specific immunizations that they are getting, and what could happen if they do not get them. Do some research into the ailments that these immunizations protect them from so that they can understand their risk and why they need to go through with these shots. While this may not help them to feel less afraid of the pain, it can help them to feel more compelled to go ahead with it. Choose a good time. Try to schedule the immunizations for a time when your parent is in good spirits and not at a time in the day when they are feeling hungry or tired. If your parent is dealing with these issues they are going to be more prone to having a difficult time with the shots. This is especially true when it comes to adults who are dealing with Alzheimer’s disease or another form of dementia and may be prone to anxiety or negative behaviors. Consider pain reliever. Talk to your parent’s doctor about the potential benefit of your parent taking an over the counter pain reliever prior to receiving the immunizations. In some situations this can help to reduce the pain that they experience and other potential side effects such as fever, swelling, or tenderness. Elder care can be a fantastic way to help your parent enjoy better health and wellbeing throughout their later years. The personalized approach to care designed by an elderly home care services provider can help your parent to address their challenges, limitations, and needs in ways that are right for their specific personality and goals. This is a powerful way to help your loved one stay as independent as possible while also staying safe, healthy, and comfortable, giving them the quality of life that you know they desire and deserve. For Elder Care Services in Atoka TN, please contact the caring staff at Personal Care Services MidSouth today! This entry was posted in Elder Care Atoka TN and tagged Elder Care Atoka TN. Bookmark the permalink.